I bought this perfume for myself years and years ago and had another bought for me at Christmas. I also bought another one for myself. It's always good to have a stock of products you really like, plus, I think I'm terrified it will be discontinued. I really like the scent of it. It's pretty musky for a floral scent. It's also very purse friendly. It doesn't last all day so a respritz is necessary after a few hours. 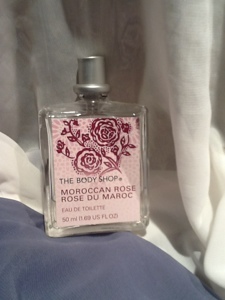 It is quite a strong scent and if you don't like rose or the smell of rose water this is definitely not one for you. I think this is a really nice perfume for late summer. Do you have this perfume? What do you think of the body shop EDTs?